Mahindra has launched the more powerful version of the TUV300 compact SUV today and therein addressed the complaints of being under-powered compared to the main rivals Maruti Suzuki Vitara Brezza and Ford EcoSport. India’s leading SUV manufacturer has appended the mHawk100 diesel engine to the existing mHawk80 motor and it will be available in the top-of-the-line T8 and T8 AMT trims. Mahindra and Mahindra has quoted a price tag of Rs. 8.87 lakh (ex-showroom Mumbai) for the T8 variant. It will be available to buy across all Mahindra dealerships in India immediately. Mahindra TUV300 mHawk100 Diesel mill with dual-stage turbocharger will feature alongside the mHawk80 engine in the T8 and T8 AMT variants. It is good enough to generate a power output of 100 bhp at 3,750 rpm and 240 Nm of peak torque developed between 1,600 and 2,800 rpm. The motor, that does duty in the Nuvosport as well, comes mated with a five-speed manual or a five-speed autoSHIFT Automated Manual Transmission. The ECO mode and Micro-Hybrid Technology has enabled an ARAI-certified fuel economy of 18.49 kmpl. With the new powerplant, Mahindra TUV300 has become the best-in-class SUV in terms of torque offered as EcoSport comes with 205 Nm and the Vitara Brezza with 200 Nm. The highway driveability of the TUV300 would have improved courtesy of the powerful engine whilst the 0-100kmph that takes nearly 20 seconds to achieve, as the TUV is the slowest of the lot, will have significantly come down as well. 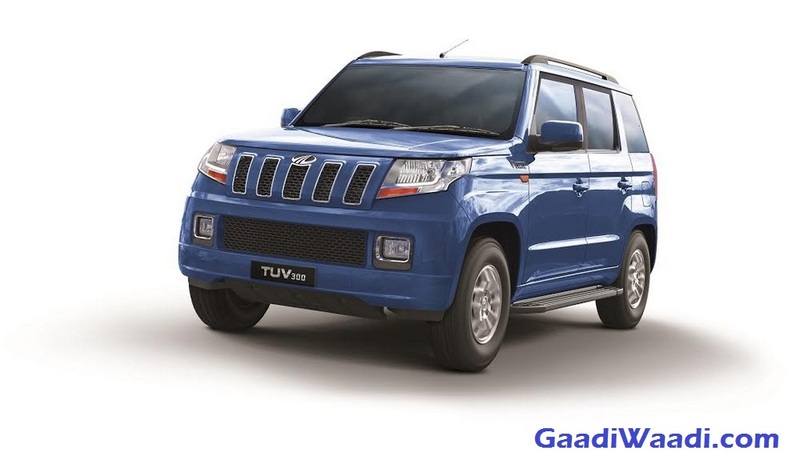 No cosmetic changes have been accompanied as the TUV300 will continue to boast a battle tank design with toughened high strength steel body built on a third generation chassis and has Cushion Suspension Technology with anti-roll bars to tackle all types of surfaces. It comes fitted with imposing bumpers, chrome inserted bold grille, slanted B-pillar, rear-mounted spare wheel, sporty alloy wheels, static bending headlamps, chrome garnished foglamps, sporty ski racks, etc. As for the interiors, the TUV300 sports a dual-tone black and beige colour scheme with chrome finishes and metal accents, a dashboard with piano-black centre fascia and a hexagon-shaped center and twin-pod instrument cluster. It features an infotainment system with 2-DIN Audio, Bluetooth, Mahindra’s BlueSense mobile app, USB & AUX in addition to a stylish multifunctional steering wheel that comprises of mounted audio and phone controls. The safety technologies equipped in the seven-seater are Dual Airbags, Anti-lock Braking System (ABS) with Electronic Brake-force Distribution (EBD), Intellipark Reverse Assist, Corner Brake Control (CBC), Automatic door locking, crumple zones strong side intrusion beams and ISOFIX child seat mounts in the second row for child safety.